CALLING HOLLYWOOD - NEW SUPERHERO FOUND! @AzharAli_ takes to the air again, almost taking a one-handed catch and preventing the boundary. That was a #Massive ! @dmalan29 giving a tough time to #Qalandars . First ball after that Abrar song and #KevonCooper runs out #ShahidYousuf off his own bowling. @lahoreqalandars back ahead! Now that was #Massive ! @dmalan29 giving a tough time to #Qalandars . #PeshawarZalmi lose their sixth wicket! Go #LahoreQalandars ! #PeshawarZalmi lost their seventh wicket! Yesss #LahoreQalandars ! HUGE WICKET! IS THAT THE MATCH? LAHORE WIN LAHORE WIN LAHORE WIN!!! LAHORE ONLY BEATS THE BIG BOYS! 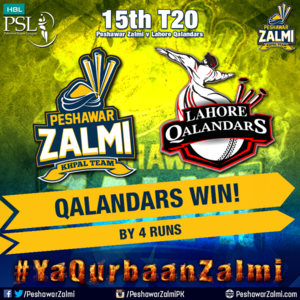 After defeating the table-topping @TeamQuetta before, they now take down the rampaging @PeshawarZalmi ! 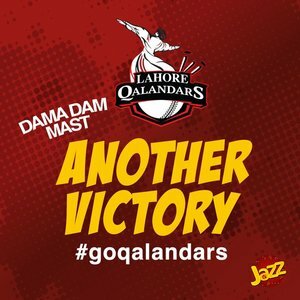 Qalandars did it! Played like Warriors today! Yesss! Alhamdulillah! 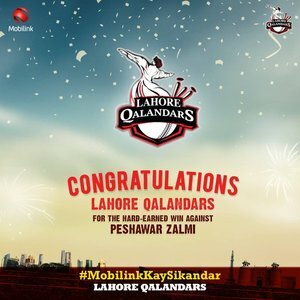 Proud of You, Qalandars! 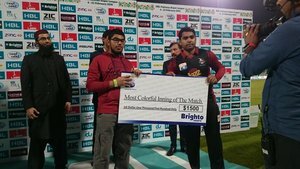 Well played by @lahoreqalandars ! Congratulations on the win!